The material presented in this introductory book on German administrative law is drawn from an annual intensive course which the author (Dr. jur. ), a practising lawyer in Germany, gives for French students specialising in German law at the Université Cergy-Pontoise / France. This course aims at providing the students with a working knowledge of German administrative law. Taking into consideration the students’ usually scant knowledge of German law, the course concentrates very tightly on the fundamentals and provides copious examples. 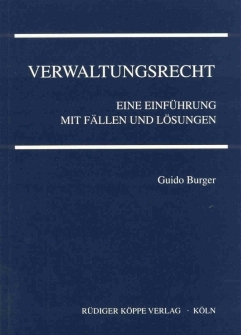 The present book is intended for introducing students at universities and professional schools who have little or no knowledge of this topic to German administrative law. Numerous case examples illustrate the possibilities of practical application of this part of German law. Every section is accompanied by study questions and sample cases for repetition and consolidation, the solutions being given in an extra section. Adding to this, all legal provisions cited in the book are given in an appendix, making this book a valuable tool for individual study and repetition.